Searching for Design Opportunities Every research project is a journey. This one started in Basingstoke, England, a small city 50 miles southwest of London in a hospital run by the National Health Service. 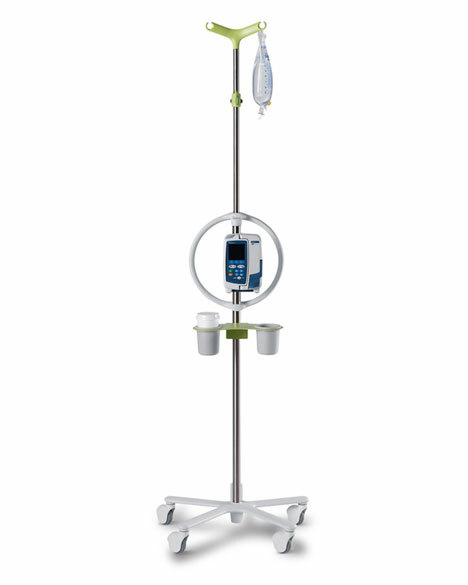 I was there for Modo to think about IV poles—an ordinary piece of healthcare furniture. Modo researches, designs and builds carts and trolleys for medical devices and customers like Herman Miller, Steelcase and Philips. This project was for Cardinal Health, a $60 billion company. Most projects start with a defined sense of opportunity—"Make it lighter," "Make it faster," "Make it cheaper." This project was different. Simon Annette, a Product Manager at Cardinal Health, had a vague sense that things can and should be better. 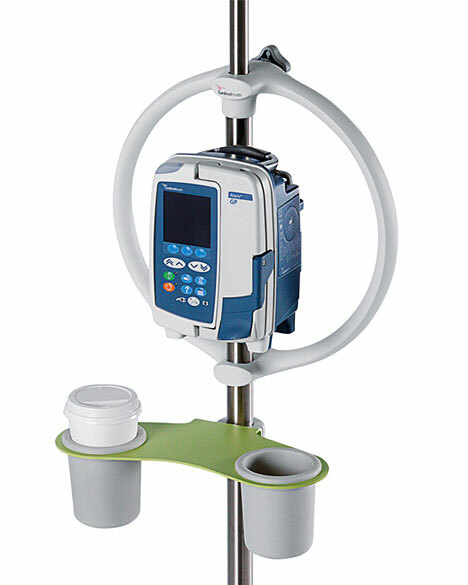 Cardinal Health pioneered the use of software to improve patient safety and reduce medication errors, but despite Cardinal's many high-tech innovations, nurses still complained about the poles they used to transport infusion pumps. Simon wanted to change things, and he asked Modo to help. From down the hall, an old man in a patient gown hobbled along pushing his IV pole just in front of him. The woman beside me muttered; "Poor sod." At that moment, I saw his IV pole as a badge of illness. Our first user interview set the tone: "They don't matter, and I don't care about them." "IV poles? I can never find one when I want one." We spoke with a range of people including nurses, biomedical technicians, physicians and nurse trainers. And as the hours passed, a handful of themes emerged. Few people had thought much about IV poles, and even fewer seemed to care about them. By lunch, we started to see IV poles as more of a nuisance than an opportunity. Maeve O'Driscoll, The North Hampshire Hospital, explains her feelings about IV poles: "I hate them." Our team took careful notes. We listened and we observed. We captured a lot of information on film. At one point, hospital security questioned me while I was photographing the outside of the building; the guard had mistaken me for a potential terrorist. I apologized, explained, and got back to work. There was no clear direction; no easy feature to add. We needed a break and took one in the waiting room behind the admitting desk. From down the hall, an old man in a patient gown hobbled along pushing his IV pole just in front of him. The woman beside me muttered; "Poor sod." At that moment, I saw his IV pole as a badge of illness. Just the sight of it elicited sympathy and fear. I asked myself: does it have to be this way? Jackie Campbell, a Nurse Specialist, told us: "We beg, borrow and steal." Each hospital we visited had an underground economy of favors owed and returned, and borrowed IV poles were a form of currency. Currency & Infection Our research continued. We moved to John Radcliffe Hospital in Oxford and made the rounds. In conversation after conversation, nurses talked about how frustrating it is to search for IV poles. We timed them, and on average, each search took fifteen minutes. How do you get the poles you need? Jackie Campbell, a Nurse Specialist, told us: "We beg, borrow and steal." Each hospital we visited had an underground economy of favors owed and returned, and borrowed IV poles were a form of currency. In keeping with hospital protocol, every time we crossed from one ward to another, we paused at the double doors and carefully washed our hands. (I washed my hands fourteen times that day.) Although the nurses were adamant about hand washing, we watched them roll IV poles from one ward to the next with no authorization or cleaning regimen. IV poles were a potential source of cross-ward infections. 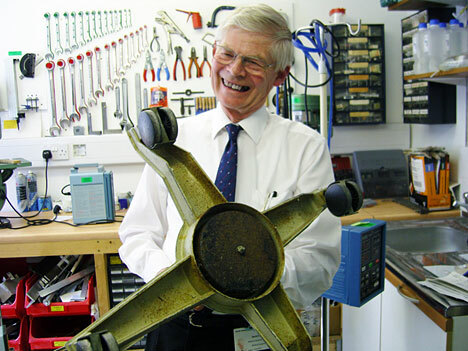 Dave Bishop at the North Hampshire Hospital, displays a rusted old base and explains he uses a hacksaw blade to clear "pubic hairs and plasters" from the wheels. A Culture of Sacrifice Time for tea. 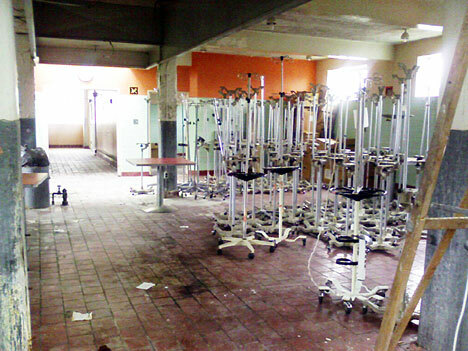 Our team sat down with a group of biomedical engineers in a large public hospital. They talked about scrounging poles from every possible source and told us about a nearby hospital that threw a group of useless poles in a dumpster. When the engineers we were talking to heard about it, they drove to the hospital, pulled them out of the dumpster and put them back to use. With limited resources, scrounging becomes a habit in healthcare. At John Radcliffe Hospital, Claire Totoni explained how nurses deal with shortages: "With a roll of tape and a pair of scissors, we can save the world." We were learning to understand healthcare's culture of sacrifice, and wondered if sacrifice was always the best way to get things done. We saw IV poles as a costly distraction from the day-to-day process of providing care. The father had his arm on his son's shoulder. The boy had his arm on his IV pole. It was as though three people were walking together. I saw the IV pole as the boy's companion. As we left the engineers, a father and son walked toward us down a long hospital hallway. The father had his arm on his son's shoulder. The boy had his arm on his IV pole. It was as though three people were walking together. I saw the IV pole as the boy's companion. Finding Big Ideas In Bristol, we pulled our notes together over a pint of Guinness to look for patterns. We mapped our thoughts, circled insights and wrote down the big ideas. Cross infection was an opportunity. We could help there by designing a process control. Searching for poles also seemed like a big idea. If nurses could cut down on the time spent looking for poles, they could have more time for patients and that is what everyone wanted. Our ideas came in flashes. In a cab outside South Kensington Station, we talked about making IV poles furniture instead of equipment. Informing our thoughts was the recognition that healthcare is becoming a consumer business. Hospital administrators and medical staff see that amenities such as good food and thoughtful interiors drive demand for their medical services and hotels are the working metaphor for new hospital design. For Cardinal's hospital environments to reflect that understanding, IV poles would need to change. Our next stop was an outpatient infusion clinic where patients rest and receive therapy. Could we give each patient a place for a cup of tea and a novel? Could we give each person a greater sense of control over his or her environment? 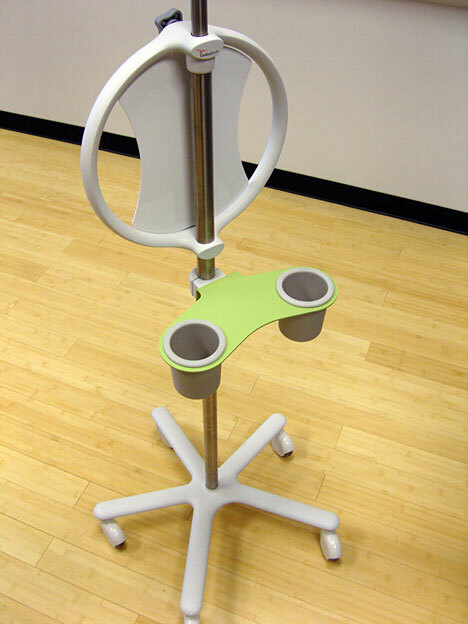 Could their IV poles become personal bistro tables? Our brainstorming continued as we flew back to the States. We mapped users and traced the movement of poles through different hospitals. We met and talked, then separated and thought about what we had seen and heard. We researched hospital cleaning protocols and analyzed a national program to reduce hospital-acquired infections (HAI's). We were making progress. We finally had a frame, which made us realize that we needed more than a product design. 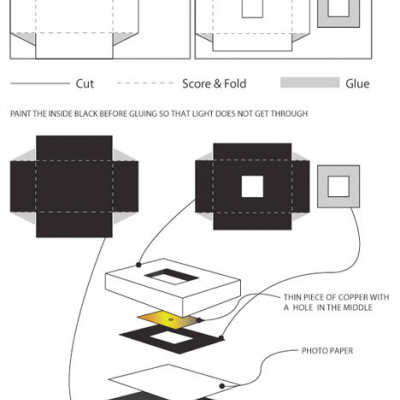 We needed an object and an experience design to support it. 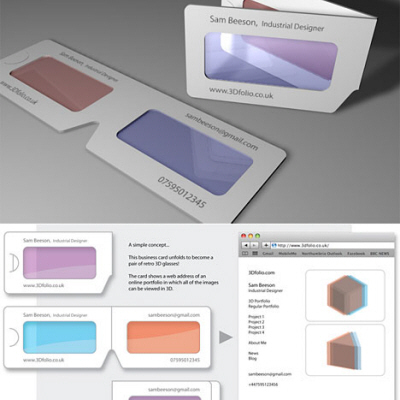 To reduce the risk of cross-ward infection, we created an ID bracelet for each pole so poles from one area of the hospital could not be poached. Finding a Solution We put pen to paper and started to draw. Fragments and threads gradually came together. We talked about how part of every design solution is something you cannot see—like the feel of the product when you move it or the weight that makes it stable. Relationships began to emerge as we defined needs and opportunities more clearly. The Process Consultants on our research team drifted in and out of the studio. They looked at sketches and talked about the problems we needed to solve. 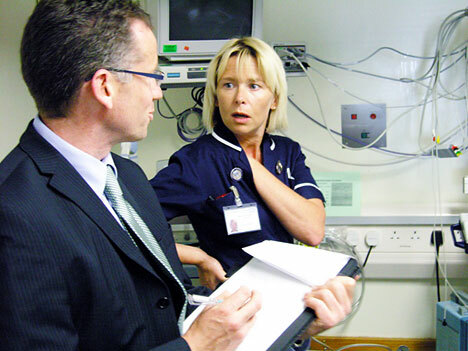 How could we help nurses spend less time searching for poles? Audible alarms would enable nurses to call an IV pole when it goes missing, but audible alarms cost money, disturb patients and use resources. There must be a better way. We created a simple guideline to match the number of pumps and poles. 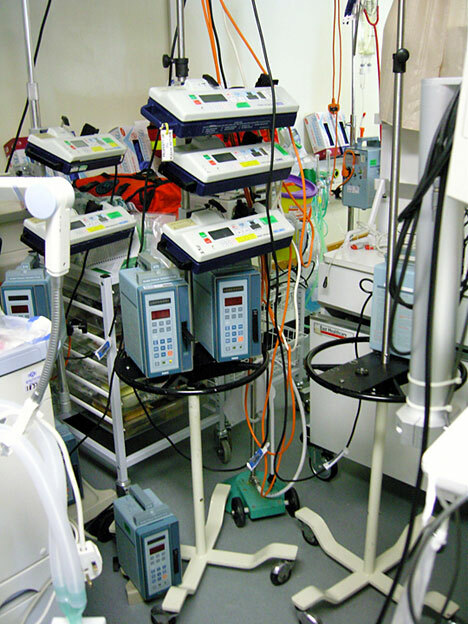 In a general ward, you need seven poles for every ten pumps. It's that simple. If you have enough poles, you lose less time. This guideline lets hospitals recover hundreds of hours of time lost searching for poles. This simple guideline means hospitals recover the cost of a new pole in fewer than 90 days. What about hospital-acquired infections? Conventional poles are hard to clean. Dave Bishop, a Medical Equipment Engineer put it best: "Castings and weld joints are impossible to clean, they need a sheep dip". First, we Googled "sheep dip," then we refined the base of the pole to minimize surface details for faster, more effective cleaning. 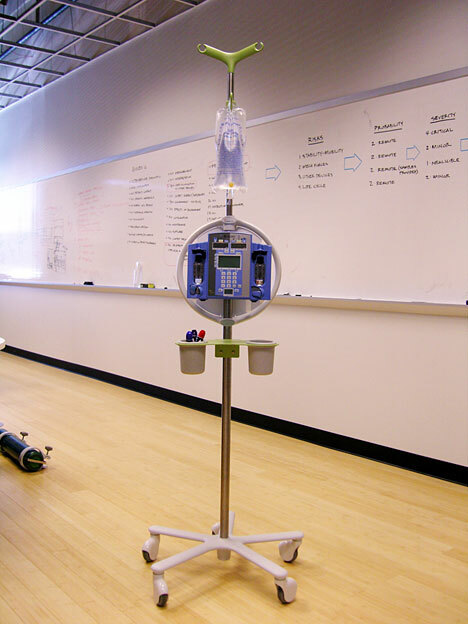 When we asked nurses what they wanted most in an IV pole, the answer was always the same: "I want it to be stable." At John Radcliffe Hospital, the record for the most pumps on a single pole is thirteen. We added weight to the base for greater stability and safety. The nurses loved this. We also made process changes by designing a trade-in program so older poles could be removed from use, disinfected and recycled. Personal messages help break down social isolation. We designed a distinctive ring handle to make transport easy and comfortable and an asymmetrical base to create a larger toe envelope and to give every pump system a logical front and back. Finally, nurses could have what they wanted: an IV pole that "wouldn't trip them up." We transformed drooping hangers for IV bags into a distinctive, easy-to-reach Y-leaf, and added a white board so family and friends could exchange greetings and messages. This helped break down the social isolation created by conventional IV poles. We even added a bud vase and a shelf for small objects and belongings. We wanted to support patients as well as technology. We even added a bud vase and a shelf for small objects and belongings. We wanted to support patients as well as technology. What happened next? The first units went to Basingstoke for evaluation. Nurses tested the poles and loved them, but the poles kept disappearing, and we didn't understand why. People wanted to try them. From Basingstoke, the poles moved to Switzerland for more testing and the results were the same. Basingstoke wanted the poles returned, but they continued their international tour. An early unit gets ready for testing. After an initial surge of interest and excitement, we settled into the process of making the vision real. Setting up production took months. 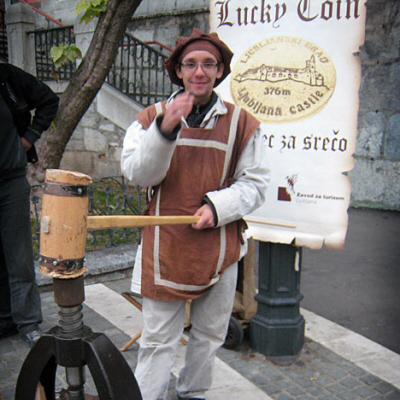 Teams were assembled, agreements were drafted and tooling was designed and built. We had people in China, the U.S. and Europe working on contracts, tooling and business details. It took weeks to work through mechanics of CE-marking. Finally, production was approved and we began building our global supply chain; what started as a design exploration in Europe was becoming a global product solution. The design made its way to the U.S., Asia and the Middle East. The original set of prototypes is well traveled, and as a result, the Cardinal IV pole has developed an international following. Modo's research won an IDSA award, a Spark Award, and a Gold Award in IDSA's NW Design Invitational. And Cardinal Health won more infusion business. Final numbers are not in yet. The poles are being integrated into the training process and into the customers' first experience of Cardinal's technology. We expect the pole will be a core offering for years to come. And what about the patients? Well, they didn't notice anything different. How could they? Increased nurse time, fewer infections and lower maintenance costs aren't that obvious to perceive. This was one of those times, however, when good design was more about making a difference than making a splash. Goo Sung is Design Manager at Modo, Inc. Since joining the firm in 2005, he has led design efforts on projects for global clients including Boston Scientific, Philips, Cardinal Health, and GE Healthcare. Under Goo's leadership, Modo has earned numerous design awards including the IDEA, Good Design, iF, and Spark Awards. Goo has taught Product Design at the Academy of Arts in San Francisco and is currently an advisor to the design program at the University of Oregon. He can be reached at g.sung[at]modocarts[dot]com. About Modo Modo is the world's leading designer and manufacturer of carts, roll stands and mobile workstations for medical technology. Modo combines market research, industrial design and global manufacturing to create innovative products that manage the physical interface between people and technology. The company is located in Beaverton, Oregon. For more information on Modo, contact Bob Marchant at b.marchant[at]modocarts[dot]com, or visit Modo, Inc. on the web at www.modocarts.com. Full of salient points. Don't stop beliievng or writing! Check out www.livengoodmed.com for how they resolved many of these issues. Another United States nurse weighing in: Ditto the above comments about the unnecessary white board and need for more pumps and bags on the pole. I concur that a stable hook system for attaching to a bed during transport would be priceless. The ring-style handles on some IV poles are good; incorporate those. Add a place to hold dead-enders and alcohol wipes. Light but stable with a low center of gravity is important. Bright, fresh colors: not so much. Height of the pole must be adjustable over a wide range with a DURABLE adjustment system. And by the way, most patients aren't drinking coffee while ambulating; they're much too sick to multi-task. Thanks for working on this problem; so much to be improved! How does this address the problem of more IV poles? If I have a patient with 4-5 infusions going along with TPN or blood, I am going to have to use 4-5 of those. So we're back where we started. Also, having somewhere to put the patient's coffee is definitely not paramount. Most patient rooms in hospitals have a whiteboard. They really don't need 2. I think you are missing the mark big time. An IV pole isn't an item of furniture in a hospital. In an ICU setting this would never work. In this economy, hospitals don't need these frivolous things to look pretty in a hospital room. Patients need IV infusions for a reason. They aren't an inconvenience that needs a design makeover. This is ridiculous. I don't know what the nurses who told you this was a good idea were thinking. You know why so many nurses said "we want it to be stable"? Because so many of us are short! I have to climb up the pole just to hang stuff on it. Add to that the fact that this one has only two hooks up there, I'd be up there all day rearranging the 2 drips and multiple antibiotic bags. Make the hooks easier for people 5 foot and under to reach. Cups are nasty and will get broken and dirty. Here's a tip: Quit designing and manufacturing single-channel pumps, period. They are a nuisance, plain and simple. They take up room and only deliver you one infusion. Triple channel pumps can be made that are slimline and take up about the same amount of room, Baxter makes some for instance. Horizon makes single channels that are stackable and at least that works for getting you about 4-ish on a pole. Take the whiteboard away, put another pump on there. Instead of cups try a slim shelf between the pumps. I need my walking patients to concentrate on walking, not on walking and drinking coffee at the same time. They usually can't manage both. And I certainly am not bringing a cup of latte around with me so I don't need a cup holder either. Bud vase? Are you kidding me?! I don't need nasty flower water that close to something that goes into my patient's arm, that's just begging for infection. Just make real wheels, the skirt thing over the wheels would be handy, (looks like the lampshade thing you put over a dog's head when they're sick) and put hooks on it at shorter heights, with multiple channel pumps. That's it. It didn't have to look like it came out of star trek. Forget the cup holders - they'll just be dust and dirt magnets. 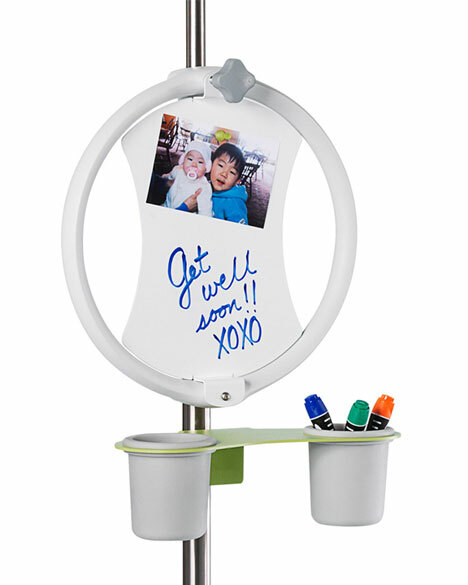 Forget the white board - nice idea, but most patient rooms already have a white board on the wall somewhere. What you really need - wide wheel base with bigger wheels to make it easier to move around. A pump that is able to deliver multiple medications at one time - some kind of pump where you can run 4-5 different meds/fluids. More than just two hooks on the top - maybe even have the hooks scattered down the upper portion of the pole, like a rose has thorns scattered down the stem. A handle on the pole to push it around, or for the ambulatory patient to push the pole around themselves. Lastly, you need something to help hold the IV tubing in one place, or gather it together, so that it's not flying about here and there (something to help patients from getting the lines tangled when they are ambulating). The pole looks nice, but seems pretty impracticable. It appears that only 1 pump fits onto the pole. Many patients are on 2 or more IV drips plus antibiotics and tube feeding, there is simply no place for more than 1 pump. . .A patient will end up on 3 different poles, which there is not room for. The white boards are nice, but every room in my hospital already has a large one, and white boards tend to get dirty and ugly over time. Also, those "cup holder/bud vases" look like a bear to clean! Ever seen those feet that come down on a bucket truck once it's parked? That's what I'd like to see, a way to lock those wheels/stabilize the stand, esp. with disoriented folks. I've seen pt's try to "crawl" up the IV line and pull the pole down on themselves. Make sure the "feet" stay inside the rollers so they aren't a trip hazard. Realize that some pts use the pole like a walker. Give them a padded "grab area" that's easy for us to clean. The board and cup holder are cute. Let's see how you clean the cups. I'd be willing to bet they end up as mini trash cans, or have spilled sodas in them before the first shift's over -- every hospital I've been at already has the write on/wipe off boards. I'd also be willing to bet they'd break off and be nice sharp hazards within a month, especially when some kid starts swinging on them to get the pens out to draw pictures on the board that is just at "kid" level. Every hospital I've been at recently already has the dry erase boards. Give us something in that spot that we don't have. The point is we don't have enough IV poles, we just need enough poles, with enough double and triple pumps on the floor so we don't have 4 poles around one bed. What I visualize is more of an upside down umbrella at the top, where we can hang off the different bags in a crashing patient, channel the tubing into "collars" at the top so they aren't flying around, and give us enough space to put the equipment we need on the pole. Impractical. I often have pt's on 4 or more different incompatible IVPB's, 2 different drips, sometimes getting blood on top of that. It's not going to fit on that one pole. The cups look like they would easily fill with spilled drinks/trash and be potential contaminants. Pt's often use IV poles as substitutes for walkers, so how is that more stable?? Where would I attach the tube feeding pump, the epidural pump, the PCA pump? There's no room left for anything after the whiteboard sign, which by the way most hospital rooms have a whiteboard in the room. I swear half the patients on my unit would need at least two of these poles to carry all of their IV fluids. The common inpatient patient is a lot sicker today then they've been in the past. Having only two fluids and one pump hanging on a pole is almost laughable. There are often multiple drips hanging. need room for more pumps - most patients need multiple pumps per pole. a hook on the bottom of it that can attach to the head of the bed for transports would be great. need more room to hand more bags on the top. a perm. transducer holder with a level attached to the pole would be priceless!!! Nice work Goo. The project came a long way and I'm happy to see you getting some press. Say hello to all the modo folks for me, keep up the good work! 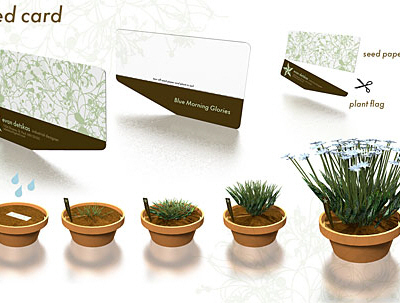 It's nicely designed with good fresh color choice especially for hospital settings. I just wish it didn't have to look like the typical "IV pole". Really good article, especially the bit about how healthcare is becoming a more commercial business. Where did you hear about the hotel metaphor? That's interesting.